Motor oil (sometimes known as Engine oils) is an oil used for lubrication of various internal combustion engines. The main purpose of motor oils is to lubricate moving parts. Motor oils also clean, inhibit corrosion, improve sealing, and cool the engine by carrying heat away from moving parts. They help decrease fuel consumption, increase power, and help maintain a healthier engine. Motor oils also lubricate the area between the bearings within the crankcase of a vehicle engine. Motor oil has a very high viscosity, which is probably it’s most important characteristic. The viscosity of a motor oil needs to be high enough to where it can maintain lubrication, yet low enough that the oil can spread to other parts of the engine. 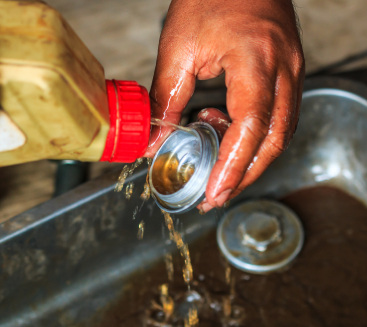 Motor oil must be able to flow under different conditions and temperatures. The Society of Automotive Engines (SAE) established a motor oil grading system based on their viscosity properties. SAE viscosity grades range from 0 to 60, in increments of 5 or 10. Some of the grades are suffixed with the letter “W”, which stands for “winter”. The SAE rates gear, transmission, and axle viscosity differently than motor/engine oils viscosity. There are two main motor oil grades: single-grade and multi-grade. Single-grade is useful within limited temperature ranges, while multi-grade can be used throughout much wider temperature ranges. Single-grade is thin and fluent during warmer temperatures, but can become thick and viscous during cooler temperatures. Multi-grade oils contain several additives which make them more independent, regardless of temperature conditions. Motor oils analysis is important in determining product specifications and/or maintaining quality assurance. Motor oils analysis is important whether you’re a manufacturer, distributor, or end user. Even for certain industries such as racing, transportation, and commercial fleet shipping, routine analysis has become the norm, due to the fact that engine inefficiency can lead to major financial losses or even worse, put lives at risk.